The initial accusation came from March For Our Lives activist Alan Vargas before Reid amplified the hoax. La Liberte eventually received death threats, according to the lawsuit. 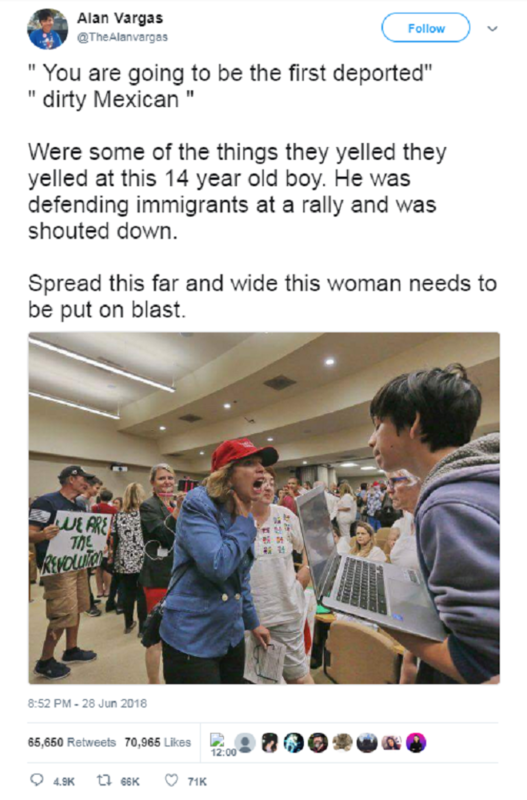 La Liberte, who was wearing a red "Make America Great Again" hat, or simply a MAGA hat, encountered 14-year-old Joseph Luevanos at a contentious city council meeting in Simi Valley on June 25. Video posted to YouTube with a private link shows their brush with one another, with La Liberte gesturing emphatically as they debate. It's difficult to hear what they say, but Luevanos' mother tells the person filming that "they're having a civil conversation" as she asks for the videographer to stop filming. If it is true that a picture is worth a thousand words, then the incident shows that sometimes those words are misguided. Vargas, the teen activist, posted a still photograph of the event on Twitter June 28, insinuating that La Liberte had called Luevanos a "dirty Mexican" and calling on his followers to "spread this far and wide this woman needs to be put on blast." In the picture, La Liberte appears to be screaming at Luevanos. Vargas' tweet was later deleted, but not before Reid retweeted the call to put La Liberte "on blast" to her 1.29 million follower base. "Reid set out to destroy La Liberte because she disagrees with La Liberte's MAGA hat and the beliefs Reid ascribes to those wearing that hat conflict with her ideology," the suit says. It isn't clear when Vargas deleted the tweet, but the last available archive is dated July 1. On July 2, Reid tweeted, "It appears I got this wrong. My apologies to Mrs. La Liberte and Joseph," linking to a local news article that quotes Luevanos saying La Liberte was "trying to keep it civil, which I appreciate." According to the suit, Reid only apologized after she received a "retraction demand." In the same article, La Liberte said she was receiving harassing phone calls and had lost clients at her business because of the photo. Luevanos said he didn't "really want" that. "I don't really want this upon her. She doesn't deserve it because she was giving her opinion at a place where everyone should be able to say their piece," he said. Deleted tweet by teenage activist Alan Vargas, which was retweeted by MSNBC personality Joy Ann Reid, for which she faces a defamation lawsuit. In the lawsuit, La Liberte claims she received "hundreds if not thousands of hate messages" and "threats on her life." Reid is one of the most vocal Russiagate conspiracy pundits on American television and, coincidentally, by far the most retweeted pundit by the allegedly "Kremlin-linked" trolls said to have meddled in the 2016 US election, according to a review of raw data by Law&Crime. 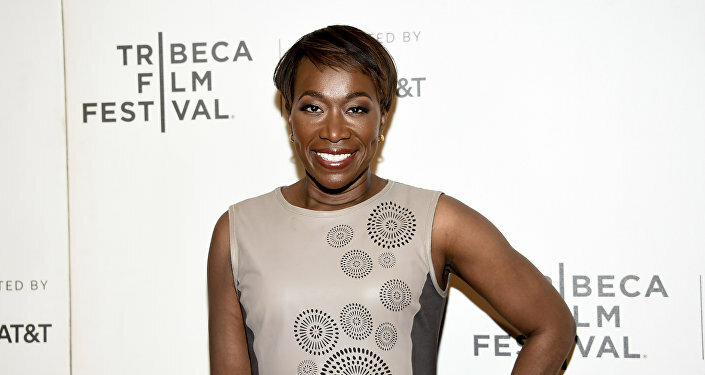 The TV and radio celebrity has a documented history of walking back her positions after the damage has already been done. Reid falsely accused David French, senior fellow at the National Review Institute, of minimizing the catastrophic effects of nuclear war after a piece he wrote was wildly misconstrued by Newsweek and RawStory. Reid characterized French's position as insinuating that only "Democrats and minorities" would be killed. While she never actually apologized, Reid conceded that her take was "off track." Further, when old Islamophobic and homophobic blog posts were uncovered on Reid's blog, in addition to 9/11 conspiracy theories and posts likening the now-deceased Senator John McCain to a school shooter, Reid claimed that she had been hacked and called for an FBI investigation. After it became crystal clear her claims didn't add up, Reid issued a backhanded apology, saying she didn't believe she wrote the posts but could understand why people didn't believe her, for which she was "truly, truly sorry." Later, Reid appeared to take a greater degree of responsibility: "There are things I deeply regret and am embarrassed by, things I would have said differently and issues where my position has changed." While Reid is the only person or entity named in the suit, she was not the only mainstream pundit to boost the false accusation against the plaintiff. Ana Navarro, a CNN anchor and supporter of right-wing, US-backed Nicaraguan contras in the 1980s — which ravaged the country with terrorism — also appears to have encouraged the hunt for La Liberte's identity after her photo was shared. "Does she have a name?" Navarro, who has more than 1 million Twitter followers, asked.